Young Parent with a Young Family? Think Protection for your Family in Case of Death! My family has just witnessed a tragic experience where a young childhood friend had a massive heart attack and died leaving a grieving wife and two small children. No will, but thankfully some life insurance was in place. This young man was an athletic in perfect condition until his fatal heart attack and no warning or planning for what his wife and mother of the two children would be required to do to care for her young family. It is very important to set up a survival plan for any young family should either Mom or Dad die at an age where the children are still home and in need of support until they finish school or reach maturity. You and your spouse/partner should discuss a financial plan that would protect your family in case of early death or total disability by either yourself or your spouse. Pregnancy is a good time to put the plan into place. THE WILL: The will is the most important item in your Family Financial Protection Plan. By creating a WILL, you MAY ENSURE THAT YOUR ASSETS ARE INHERITED BY THE PEOPLE OF YOUR CHOOSING (YOUR FAMILY) RATHER THAN THE STATE’S IDEA OF WHAT IS PROPER. TO DIE WITHOUT A WILL IS TO DIE “INTESTATE”. This means that the State (Texas) will determine the percentage of property that each family member will inherit after an individual die. The process of administering an estate through probate court can take months or longer once a judge appoints an executor to take over the deceased’s financial affairs. During this time the family may not have access to money left to them to pay the family bills from this estate. BIG PROBLEM! 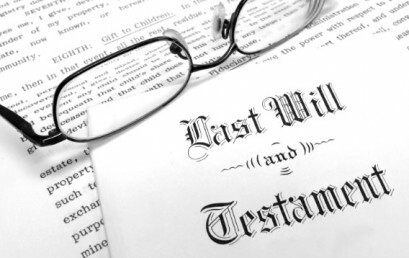 After having a will for both spouses/partners of the family executed make sure that an original copy is left with your attorney for safekeeping. Very Important! Have another original copy in a secure place where the executor or a family member will be able to retrieve it at the time of your death. POWER OF ATTORNEY AND PROXIES: At the time of making out your will, make sure both parents have a Health Care Advance Directive and a Living Will prepared and executed. You need to designate a first and second choice of a person over 18 years of age to be your proxy. Your Living Will is your intentions for end of life care, such as when to have your doctors withhold treatment and let you pass or if you would like to be an organ donor. It is very important that these documents are with your Will and accessible to your proxies, since many times, if there is a serious accident or medical emergency, you or your spouse will not be able to make serious medical decisions regarding your life or death. BENEFICIARIES: When you meet someone, marry, or join in a domestic union, it is important that as to any financial accounts you have (bank account, retirement fund, 401K, trust fund, stocks bonds), you should change the beneficiary to your spouse/partner. It is also a good idea to have a second beneficiary, either a child or family trust, in case you and your spouse/partner were both in an accident and die. If your children are young do not make your beneficiary a guardian who promises to take care of your children. Set up a family trust which will support your children and a trusted trustee for the trust. Guardianship: Another very important item in your will for parents of minor children under 18 years old is APPOINTING A GUARDIAN IN YOUR WILL FOR RAISING YOUR CHILDREN. There should be a mutual joint decision on who will take care of the children if both you and your spouse/partner are deceased. By setting up this preference in your will, the proceeding judge will usually honor your request when setting up a guardian for your children. INSURANCE: Life Insurance may be costly, but it ensures that if you or your spouse/partner dies young, the surviving spouse/partner will be able to have the physical means to allow a slowdown working a job to take care of your young family without financial worries. It is always suggested that you start an insurance policy on both parents when they are young and healthy to keep costs at a manageable amount. Many companies also offer disability insurance to replace a percentage of salary if an employee becomes incapacitated. Long-Term- Care Insurance is also an option. Finally make sure that all important financial and personal documents are always kept up to date and located in a secure place where they can be found in case of emergency or death! Some of the most important documents: bank and financial institution accounts, insurance information, credit cards, retirement account with beneficiary information, bills and list of bills on autopay monthly, deed of house, title to cars, boats or etc., and safety deposit key. *Always have an updated list of online accounts, passwords, and credentials to any cryptocurrency wallets. A divorce can be grueling is transformed by law, probate, and insurance decisions made prior to divorce. It is important to know exactly what will happen to your will and life insurance if this misfortune happens to befall your family. The family unit is important and if it is fractured the question of what happens to “my will”, “my life insurance”, or “my trust” is a relevant and important one that needs to be answered. If you are divorced from your spouse then your previous will may be in many aspects considered revoked automatically. Under the Texas Estate Code § 123.001 after a valid divorce, all provisions in a will, including all fiduciary appointments, shall be read as if the former spouse and each relative of the former spouse who is not a relative of the testator failed to survive the testator, unless the will expressly provides otherwise. The translation of this states: if you receive a valid divorce then your will is in many respects revoked and your spouse and stepchildren will receive nothing from the previous will. The one exception is if the will explicitly states that in case of divorce the previous spouse or children will still inherit. This revocation applies to fiduciary appointments as well. For instance if you have a trust and your spouse is the trustee, then she will be revoked from the trust in its entirety. These are the exceptions for life insurance. If you decide to divorce your spouse unless further action is taken, the spouse will not benefit from your death regarding the life insurance. Finally, the inheritance of a divorced spouse in reference to a trust depends on whether the trust is revocable or irrevocable. If you have set up a Revocable Trust then after the divorce your prior spouse will automatically lose his/her beneficiary status within the trust. On the other hand, if you set up an Irrevocable Trust then regardless of a divorce the prior spouse will still inherit and be considered a valid beneficiary. A divorce will have no effect on an Irrevocable Trust. If you decide to create an irrevocable trust, be sure to understand that your spouse will inherit the assets in the trust even after a divorce. In a Texas divorce, the law protects you from unchecked gifts to your prior spouse and stepchildren with regard to your will, life-insurance, and revocable trusts. The prior spouse will not take from these unless one of the few exceptions apply. Divorces are riddled with complexities and it is prudent to seek advice from an experienced Texas divorce attorney during these proceedings to ensure that the divorced spouse is removed completely from your will and does not reserve an argument to acquire your assets post-divorce .